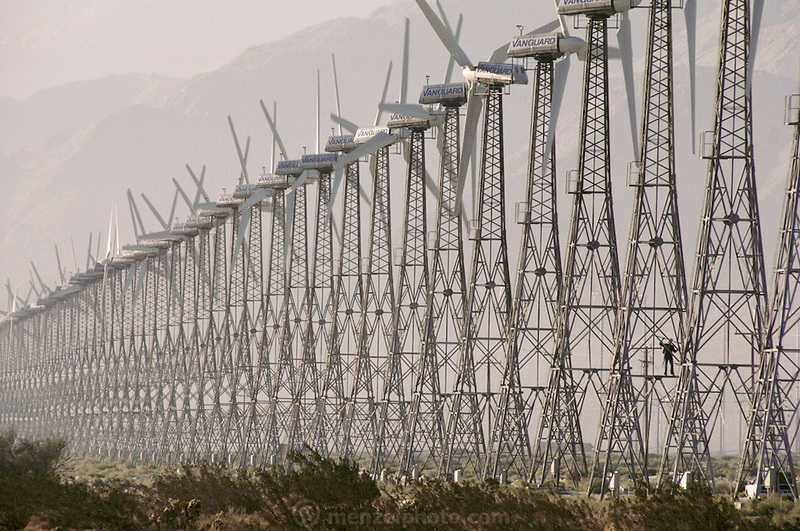 Wind farm producing electricity at San Gorgonio Pass, near Palm Springs, California. Wind Turbines. View of a wind farm with several wind turbines each with 3 spinning rotor blades. Wind power is used to drive a turbine for the generation of electricity. The electrical energy produced from a turbine is proportional to the cube of the wind speed. Thus, a 10-meter per second wind will produce 8 times more energy than a 5 meter per second wind. Wind turbines vary in size from large generators with a 1-3 megawatt capacity to small machines producing only a few kilowatts. (1986).